I clearly have no idea how to begin this post and I have been staring at the screen for past few minutes for inspiration. That doesn't seem to be working and I am taking the easy way out. 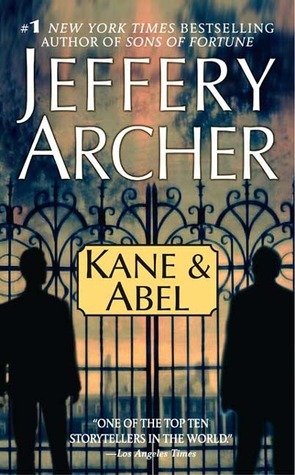 In a line I can say that Kane and Abel by Jeffrey Archer is one of the riveting book that I have ever read. Archer has a gift for crafting stories with such intricate and complex plot, spanning over years that keeps the reader glued to it till they have turned the last page. He is a genius master story teller without a doubt. In Kane and Abel, Archer tells your the story of two men, William Kane and Abel Rosnovski. The former is born with a silver spoon and the later is a penniless Polish immigrant. Born on the same date, in opposite sides of the world, they have only one thing in common - ambition and when fate brings them together at crossroads of life, there is friction of enormous proportion that will do good to none of them. The story takes the reader through the life of both men, right from the moment they were born and to the point they breathed their last, alternately, and as a reader you will feel torn between the two protagonists. The way the author has intricately woven important historical incidents and happenings in the story, reiterates the fact that only a genius can do it. The unrest in Poland and rest of Europe, the barbarity of the Hitler regime, the World War II, the Great Depression and the rise of America are a constant backdrop in the history and still not for a moment, you will feel subdued. There are so many characters, sub plots and still the story holds together as one. Over 60 years and three generations, through war, marriage, fortune, and disaster, Kane and Abel with unconsummated hatred for each other, battle for the success and triumph that only one man can have. It all culminates in to a spell binding saga of ambition, hatred, success, failures and love. Even though you might feel pulled toward one character or the other, the author always have justified the way they act or do things. The end comes as a masterful surprise, which you can expect from a Jeffrey Archer book, but can never guess. Other than the two main characters, the other ones that stood out for me were Kane's wife - Kate and Florentyna, Abel's daughter. Kate is an epitome of understanding and I loved the way she stood by her husband through thick and thin. Florentyna comes to me as a person who is strong and dares to dream and follow her heart. And it comes as a no surprise to me that she is the main protagonist of the next book of the Kane and Abel series, The Prodigal Daughter (which I have already laid my hands on and can't wait to read). In a nutshell, it was fantastic read, full of twists and turns that will keep you on the edge, great historical backdrop, well sketched characters, ingenious plot and a jolting ending. It has all elements of an Archer book and if you love his work, you can't miss it. I only wonder why it took me so long to put my hands on it. Kane and Abel was first published in 1979. Oh this is a wonderful book.. in fact the second one is good too..Shall is tell the president becomes a lil dull.. love the ending of this book! I have read this one long back in college.. one of the highly recommended pick..
this is a wonderful capturing book!